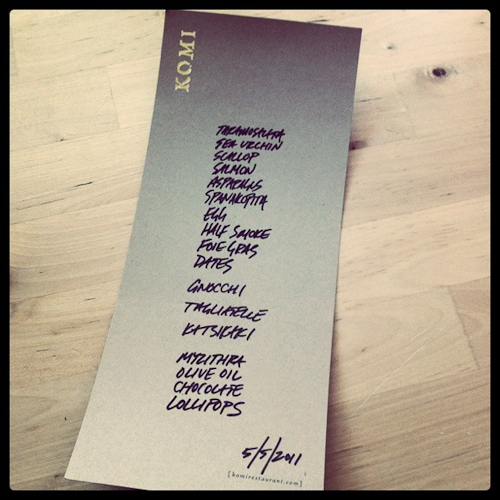 I had been dying to eat at Komi ever since Ruth Reichl named it as her most recent "wow" dining experience. She recounted a Cromesquis of Caesar Salad she had, a small breaded and fried square containing the elements of a Caesar salad that burst in a flood of creaminess and a slight crunch of lettuce. 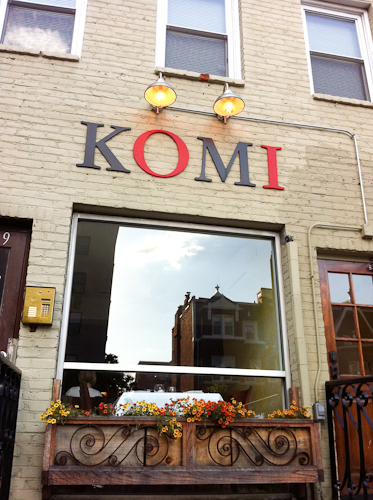 When we found ourselves in DC, we asked friends and locals where we should eat, and Komi was at the top of every list we received. Chef/owner Johnny Monis has created something great here, a premier dining destination for food lovers that is refined and playful at the same time. There is no printed menu at Komi, and photos of the food are not allowed (to maintain the element of surprise for future diners). After I got over the distress of not being able to take pictures of my food, it was all quite liberating. 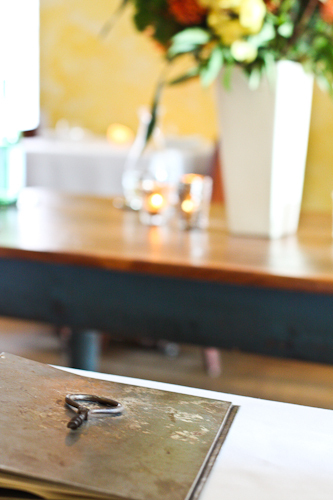 The dishes change from day to day, depending on what is in season, or what Monis feels like making for you. For the set price of $135, you can expect a flurry of Mediterranean/Greek-inspired small tastings that start with light, fresh crudo and build up to heartier flavors, pastas, and a family-style meat entrée, followed by a cheese course and desserts. There is also an optional wine pairing for $70 that they allow you to split, which is nice. The restaurant is built in a Dupont Circle rowhouse, so the dining room is small and the décor is pretty sparse (simple white tablecloths, warm yellow walls and a few candlelit sconces). I can only imagine the buzz about the place when the Obamas had their date night here last year. The overall vibe of the place is pretty laid back and comfortable. Our servers were friendly, super knowledgeable, and enthusiastically chatted with us about the food when we engaged them with questions. The first amuse bouche was a doll-sized steamed brioche, topped with a dollop of Greek yogurt and fire orange trout roe that burst delicately on my tongue. Next came a thin slice of Hiramasa New Zealand kingfish sashimi topped with Alaskan sea urchin. Fresh and appetite inducing. Scallop crudo two ways. A thin disk of scallop sashimi arrived, laid inside a large pearly white shell the size of my hand, garnished with a slice of rhubarb and a sprinkle of lemon salt. Next to it was a spoonful of scallop tartar, diced into a fine brunoise, combined with thick coconut milk mixed with caramelized coconut. A tiny purple chive blossom graced the top of the mound. I loved the luxurious texture, slippery and rich, perfumed with coconut and finished with an herbaceous oniony punch. This bite reminded me of a perfect salmon bialy. A slice of house-cured Scottish salmon on top of black squid ink toast, garnished with tatsoi microgreens and red-veined sorrel leaf. A little bit sweet, a little bit crunchy…a lovely bite. Burrata was served with asparagus so lightly grilled it was almost still raw. The fresh crunch of it played well with the cool, creamy cheese, and a sprinkle of garlicky, lemony breadcrumbs on top added a nice dimension to the dish. Ah-ha! The dish that wooed Ruth Reichl! Although a different version (she had a "Caesar salad" cube, we got a "spanakopita" cube), the concept was the same. Our server came, bearing two small deep-fried, breaded cubes. We were instructed to eat it in one bite. As I bit into it, a warm gush of emulsified spinach and feta cream flooded my mouth. What a stunner. One little square, full of spinach-feta-yogurt-dill-ness, crafted just so, poised and ready to explode in your mouth. What kind of voodoo is Monis working back there, hmm? Our first pasta dish was a beautiful, perfectly round raviolo filled with a runny yolk inside. Smoked tuna shavings (like bonito) danced on top, the residual heat making it eerily wave back and forth over the butter sauce and accompanying ramps. One of Komi's signature dishes in which they pay homage to a DC staple -- the half-smoke. Similar to a hot dog, but meatier and spicier, the half-smoke is traditionally made with half pork, half beef. Komi's version is all pork, and is cut to the size of about a quarter of a dog, so I guess technically it's a quarter-smoke. It is butterflied, nestled into a buttered, grilled bun, and topped with tomato jam and an Old Bay-dusted chicharrone. You really can't enjoy a hot dog without a beer, so the kind folks at Komi serve this bite with a glass of Hitachino Nest Ale. From hot dogs to foie gras, next up was a house-cured and smoked foie gras terrine. Pink, buttery, and smooth as silk, it was served over sautéed mushrooms, slices of kumquat and peashoots. A little intermezzo before we moved onto the heftier courses, we had a sweet taste of roasted dates filled with mascarpone cheese, generously dusted with coarse sea salt, and drizzled with olive oil. Yukon gold potato gnocchi in sea urchin butter sauce –- I had heard whisperings of this divine dish and had my fingers crossed that it would grace our table this evening. Apparently it had been off the menu for awhile, but lucky for us, the dish has been brought back! The uni butter was as heavenly as I had imagined, and infused the gnocchi with a rich sweetness of the sea. A confetti of chives decorated the dish, and a little bit of habanero spiked the sauce, bringing a soft glow to the back of my throat. A small tangled nest of house-made tagliatelle came next, served with salt cod, thin shavings of flash-fried nutty caper berries, tiny currants, and pine nuts in a tomato sauce -- sweet, salty, tangy...so good!! The crispy disks of caper berry added some briny crisp to the mix, and the sauce had a pleasant vinegary twang to it. A touch of chili here also piggybacked well off the lingering glow of the habanero in the prior dish. The pièce de résistance of the meal was the Katsikaki -- a massive serving of an entire bone-in leg of baby goat, slow roasted for four hours. We were blown away by the depth of flavor and range of texture in this hunk of lovin'. The entire outer surface had a crazy crispy sear, the meat was juicy and tender as can be--the texture of pulled pork--and there was a bit of rich stickiness from what I guess was melted cartilage. I'm pretty sensitive to gamier meats, so when this came out, I was a bit apprehensive. But there was zero gaminess. Just pure awesomeness. The meat was served with homemade pita and a whole plate of condiments, creating a DIY gyro station at our fingertips! Accoutrement included preserved lemon sea salt, red onion mustard, slightly pickled Fresno peppers, homemade tzatziki, and delicate translucent slices of baby radishes. Next came what looked like a macaron but was in fact a teeny tiny biscuit sandwich of sheep's milk myzithra cheese garnished with candied fennel. The curd comes from a local farm and the cheese is made in-house. It was the one dish of the meal I didn't care for -- the cheese was really pungent and presented a bit of a challenge for me. A creative take on some classic flavor pairings, our first dessert consisted of strawberry segments tossed in balsamic vinegar, topped with a quenelle of olive oil gelato, and a thin cracker-like piece of lemon shortbread that shattered at the poke of a spoon. And since no meal is complete without a little chocolate, our meal wound down with a square of dark chocolate ganache and salted caramel layered over a crust of peanut butter crunchies/praline. Both the chocolate and caramel were surprisingly light and melted away without the slightest effort in spite of how full I was. Alongside the chocolate-caramel square was a bit of roasted banana crowned with coconut ice cream and a sprinkle of curry. Our parting gift was a pair of elderberry lollipops. A member of the honeysuckle family, elderberries have an intriguing floral-grapey flavor. After our meal, we were invited to peek into the kitchen and shake the hand of the mastermind behind our fantastic meal. Arlington native, Johnny Monis opened Komi at the ripe age of 24. Seven years later, it's clear he has more than hit his stride, creating food that is not only impeccably executed but full of personality and a little attitude. Johnny was kind enough to handwrite our menu for the evening as a keepsake.